Pelargoniums, or storksbills, are popular bedding and pot plants because they are very easy to grow and give abundant colour to the garden and patio throughout the summer. They provide a reminder of Mediterranean holidays, where the closely spaced houses along tight mountain village streets are adorned with ubiquitous pots of zonal Pelargoniums on every windowsill, doorstep and passageway. Perennials in their native southern African range, they are tolerant of drought and heat, but they are susceptible to even the slightest frost. As a result, they are normally treated as tender annual bedding or as indoor plants in pots that may be put out in the garden for the summer. Confusingly, Pelargoniums are often called ‘geraniums’, but the true Geraniums (or cranesbills) belong to a related genus of hardy herbaceous plants, with a number of native species in Britain. Both groups have five-petalled flowers, but in Pelargoniums, the lower three petals are different from the two at the top, whereas Geranium flowers comprise five similar petals. Hence, the Pelargonium flower is symmetrical in one plane only (left to right, like a human face), while Geranium flowers have radial symmetry (in multiple planes like a daisy flower). There is a bewildering array of Pelargoniums in cultivation, but in addition to the species and the primary hybrids, the varieties that are most commonly used as garden and pot plants can be separated into six groups. The zonal Pelargoniums (sometimes called Pelargonium x hortorum) are the familiar bedding plants that are sold by the thousands in garden centres and supermarkets every spring. Fashions come and go, but the zonal Pelargoniums are amongst the most traditional of the summer bedding plants, and are especially popular in municipal flower displays in parks and public gardens. There is a huge range of zonals, but they are all generally upright and bushy plants. Their rounded, green leaves have a central variegated pattern, which can be black, bronze, gold, yellow, red or silver, and they can be bicoloured or tricoloured. They bear heads of single or double red, pink, white, orange or purple flowers on tall stems. Zonal Pelargoniums were developed from hybrids of Pelargonium zonale or P. inquinans. Several forms are available, including ‘basic’, ‘dwarf’, ‘miniature’, and ‘micro-miniature’ types. They are widely and cheaply available from garden centres in trays and as plugs, and the popular varieties include ‘Greta’, ‘Alma’, ‘Violetta’, ‘Rosita’, ‘Vancouver Centennial’, ‘Samelia’ and the bicoloured flowers of ‘Salmon Queen’. ‘Iceberg’ is one of the most fashionable white-flowered varieties. A favourite hanging basket, window box and tall container plant, the ivy-leaved Pelargonium has a trailing growth form with long stems of single or double red, pink or white flowers that tend to flop. Their ivy-shaped leaves are generally waxy and fleshy, a drought-resisting trait inherited from the parent species Pelargonium peltatum. Popular varieties come in a rich variety of colours, and include the deep red ‘April Hamilton’ and ‘Choun Cho’, the pink ‘La France’ and the white ‘Grandeur White’. Sometimes known as ‘show Pelargoniums’ because of their bushy form and large, richly-coloured flowers, the regal Pelargoniums are grown by enthusiasts for their beautiful purple, pink or white and principally single or semi-double flowers. They have rounded, sometimes lobed and serrated leaves that typically do not show any zoning. As a rule, regal Pelargoniums are kept in pots in conservatories and greenhouses, as the flowers are quickly damaged by rainfall outdoors. In addition, they require more watering than other types and a warmer home through the winter. One of the most popular varieties, Pelargonium ‘Lord Bute’ has velvety, rich-purple petals with paler edges, while the names of many others – such as ‘Burgundy’, ‘Howard’s Orange’, ‘Elegance Coral Sunset’ and ‘Mona Lisa White’ divulge their colour. The compact and bushy angel Pelargoniums originated from a cross between Pelargonium crispum and a regal variety. 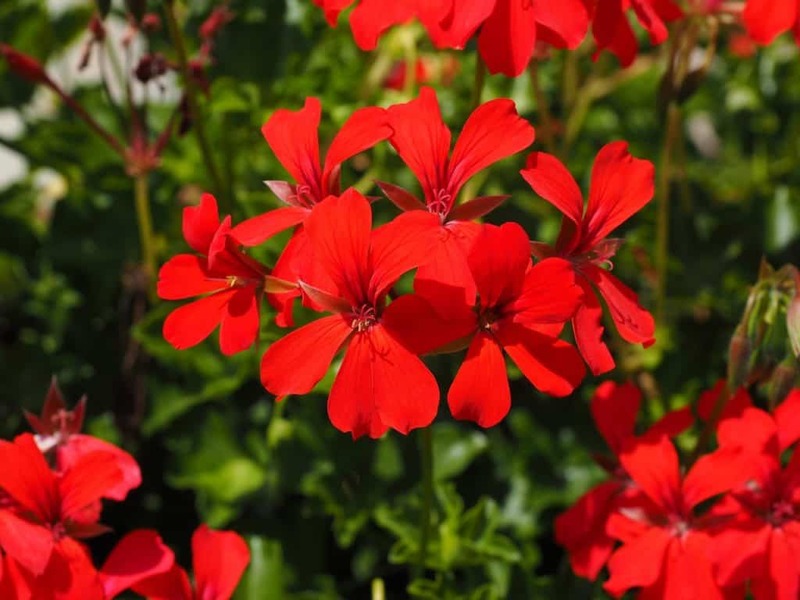 Looking like miniature versions of the stately regal Pelargoniums, with small, serrated leaves, and relatively small, typically pink or bicoloured pink and white flowers, they are good for hanging baskets. ‘Quantock Perfection’, ‘April Shower’ and ‘Rockwell Sophie’ are very popular varieties. As the name suggests, these shrubby perennials are grown principally for the fragrance of their foliage, rather than the beauty of their generally small and delicate flowers. They have their own dedicated group of enthusiasts who often accumulate large numbers of plants. They are mostly kept as indoor collections, though they will do well if the pots are taken outdoors for the summer. The group is diverse, and includes species and cultivars, but each type has gently hirsute leaves with a distinct scent that is released when the leaves are touched or rubbed. There is an enormous range of scents, of which some are aromatic and others are quite pungent, and some people find a few to be quite unpleasant. Many release fragrances that resemble those of other plants, such as apricot, rose, eucalyptus, apple, coconut, lemon, lime, citrus, peppermint, lavender and pineapple. Others are compared with less blossomy smells, including camphor and the more culinary chocolate, nutmeg and cinnamon. There are many lemon-scented types, including Pelargonium ‘Queen of Lemons’, ‘Lemon Kiss’ and the popular ‘Bitter Lemon’, with its dark green leaves that have a strong, citrusy scent. The flowers are a delicate pale pink. Rose-scented varieties are amongst the most popular with scented-leaf Pelargonium aficionados. Pelargonium capitatum ‘Attar of Roses’ has pretty, pale pink flowers and has been given an RHS Award of Garden Merit. It can be used in the kitchen to make scented sugar that can then be used to make jams and in baking to give food a delicate rose flavour. P. x citrosum ‘American Prince of Orange’ has a very strong orange scent. It is also a very attractive plant, with dark, glossy leaves and pink blooms that repeat-flower throughout the summer. The leaves can be used in the kitchen to give an orange flavour that is said to lack some of the acidity that comes from using citrus fruit. Apple-scented Pelargoniums are also popular and numerous, and include ‘Fringed Apple’, though the species P. odoratissimum is probably the most widely grown. It has softly hairy leaves that release a very convincing, fresh apple perfume. The delicate white flowers will be produced in profusion if it is kept in a sunny window, and with a compact and low-growing form it is ideally suited to pots and small containers. The remaining Pelargonium types are often referred to as the ‘unique Pelargoniums’, simply because they do not fit neatly into any of the previous categories. Popular varieties include ‘White Unique’ and the red and pink-flowered ‘Bolero’. Many of them are derived from Pelargonium fulgidum. Some have distinctly scented, blotched or bicoloured leaves, and most have relatively small flowers with feathery petals. Some unique varieties have been hybridised with regal types to produce a range of ‘hybrid uniques’, which produce much larger and more abundant flowers. Many of the original species Pelargoniums remain popular with gardeners, and in themselves show an amazing variety of habit, shape, size and colour. The primary hybrids result from a first-time cross between two different species. Popular examples that have been used to produce a variety of cultivars include Pelargonium x ardens (from P. lobatum and P. fulgidum) and P. x glauciifolium (from P. gibbosum and P. lobatum). Pelargoniums can be grown in borders, baskets and patio containers, but if left outdoors, they will die off at the first frost. With a little care, prized varieties grown in pots or lifted from the border and potted up into John Innes No 1 potting compost can be carried through the winter in the greenhouse or conservatory. The plants should be cut back to 10cm when they are brought in to prevent soft growth, though pot-grown plants that are brought indoors in the early autumn may continue to flower in a cold greenhouse if kept at around 7°C to 10°C, so these can be cut back after flowering has finished. They will require watering only very sparingly, and they should be kept in a well lit, ventilated but frost-free position. They should be re-potted and hardened off gradually before finally placing them back in the garden for the summer once the risk of frost has passed. Alternatively, varieties with tough woody stems can be overwintered in a semi-dormant state. Each plant should be carefully lifted and the soil brushed off the roots. Spread the plants out in a shed, outhouse or other frost-free place until the foliage and stems are quite dry, and then wrap them in newspaper. Store in the frost-free shed throughout the winter. 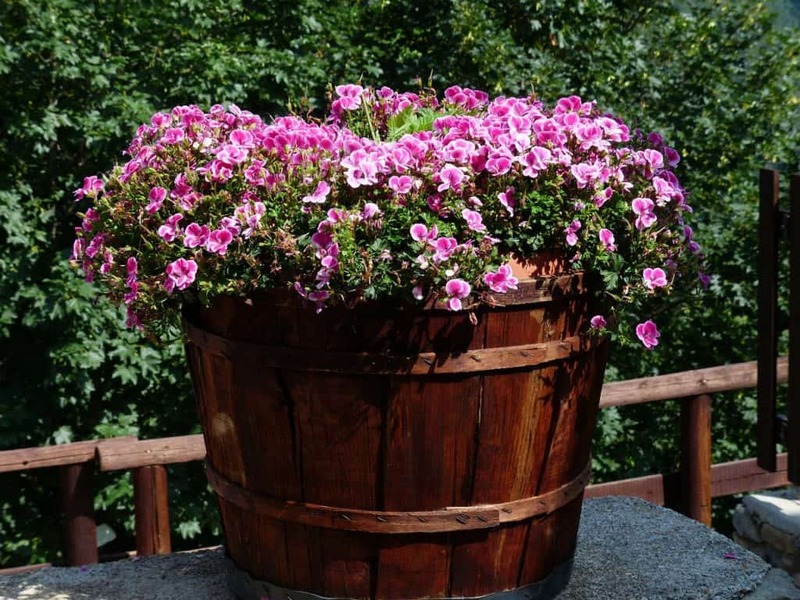 The following spring, with luck, some of the plants will show signs of fresh growth, and these should be put in a bucket of water for several hours to soak the roots thoroughly. Pot these up in John Innes No 2 potting compost and cut the top growth back down to approximately 10cm. Harden off gradually, and then once established and putting on new leaf growth, the pots can be put out, or the plants transplanted into the garden border. Most types of Pelargonium thrive in full sun, though zonal cultivars will tolerate some shade. Regal cultivars are the main exception, as they prefer positions in partial shade, at least during the main heat of the day. Ideally, plants grown in a greenhouse or in a south-facing window should be shaded from the most scorching, midsummer, lunchtime sun. Keep new plants on the dry side until established, but then water plants in containers well during the growing season from spring to summer, without letting the compost get too wet. Always provide good ventilation. Plants in the border should be watered lightly in the driest summer conditions. Plants brought inside for the winter need watering only very occasionally and sparingly. The most popular varieties are not particularly fussy, and can be grown in any relatively fertile, neutral to alkaline garden soil. For cultivation in indoor or outdoor pots and containers, use any well-drained, peat substitute multipurpose compost or a loam-based or soil-based compost such as John Innes No 2. Once new growth begins, give the plants a fortnightly feed of a balanced liquid fertiliser through the spring, but once the flowers start to form, change to a high potassium feed such as a tomato fertiliser to encourage regular blooming and a good balance of flowers against foliage growth. Re-pot Pelargoniums in mid-spring into John Innes No 2 potting compost for the best results. Pelargonium plants should be dead-headed regularly throughout the flowering season to maintain and promote more blooms. Plants that are kept indoors year-round or brought into the house or heated conservatory for the winter will often benefit from rejuvenation in the spring through hard pruning. Aim to remove about half of the growth and cut just above a leaf, though with woody types in particular, always ensure that viable growing points are retained. Most of the Pelargoniums are naturally bushy, and pinching out some of the plant’s growing points just above an opened leaf in spring or early summer (‘finger and thumb pruning’) will encourage further branching and a more compact and rounded form. The ivy-leaved cultivars will also benefit from this treatment, as it will promote more branching and a denser growth of trailing stems over the edges of a container or hanging basket. Some varieties, especially the scented-leaved types, can grow into tall, vigorously growing plants that can become a little straggly or top-heavy. These can pruned to form an upright pillar shape that can be trained on canes. Indeed, some growers use the pinch-pruning technique to develop simple shapes to their plants, such as fans and standards. Use a supporting framework of canes, and always start with a healthy new plant, encouraging a compact bushy growth to begin with, and then selectively pinching out growing points to encourage the shape that is desired. The best results tend to be obtained by allowing three of four leaves to grow on the stimulated side shoots, then to pinch out those, and so on. Regular pruning is required to obtain the preferred shape and to keep a vigorous plant in check. For general bedding and patio pots, the common varieties of zonal Pelargoniums are freely and cheaply available in plugs, trays or small pots from garden centres, online or from mail order catalogues each spring, ready for planting out as summer bedding and mixed summer border plantings, so there is little reason to worry about propagation at home. Even the less common varieties are now easily obtainable from the many specialist nurseries. However, true Pelargoniphiles and those with unusual varieties that they wish to propagate can multiply their stock by taking softwood cuttings at any time from late spring through to the late summer. Use non-flowering, strong, healthy stems, and cut just above the third joint beneath the growing tip of the stem. Trim the cutting below the lowest joint and carefully take off the lowest leaves. Plunge the cuttings into a well-wetted but drained seed or cutting compost in a sheltered and well-lit position. A 13cm pot will accommodate five cuttings. Do not water for the first week, then water weekly from below by placing the pot or tray into a container of water for a few minutes. This helps to prevent grey mould and damping off diseases. Once rooted, the cuttings can be overwintered in pots or trays of compost kept on a bright indoor windowsill or in an unheated greenhouse. Water them very sparingly in winter, allowing the compost to dry out between watering. Start to feed the developing cuttings weekly in early spring, using a balanced liquid fertiliser. Pinching out the shoot tips will encourage a bushier form. The plants can then be potted up individually from mid-spring, before hardening off gradually. The pots can be moved to the garden or the plants put in the border once all risk of frost has passed. For extensive bedding schemes, the zonal and species Pelargoniums can be grown from seed sown into trays of seed compost during the late winter, and grown on in pots or plugs in a heated greenhouse through the winter. The young plants should again be gradually hardened off before planting out. The popular hybrids are quite difficult to raise from seed, and the commercial nurseries use controlled temperatures and artificial daylight conditions to produce their plants. Pelargoniums can develop dense clusters of distorted leafy shoots, generally close to soil level. These are leafy galls, caused by a soil-borne bacterium that enters the plant through wounds. Affected plants and the soil from around them should be destroyed. Hands should be washed thoroughly afterwards, and any tools used on the plant need to be sterilised before further use. Container grown plants are prone to vine weevil larvae damage, and bought plants should be checked before taking them home, especially if they are not from a specialist nursery. Other common pests of Pelargonium include leafhoppers, root mealybug and whitefly. Biological control agents and insecticides are available to control such pests. More rarely the plants are attacked by the caterpillars of the angle shades moth. Pelargoniums can suffer from viruses transmitted by sap sucking vectors such as aphids and thunderflies (thrips). They are also prone to diseases spread through the cross-handling and management of plants, so tools such as knives or secateurs should be cleaned and ideally sterilised before use. The plants can also develop fungal infestations such as grey mould or rust if they are kept in damp situations with poor air circulation. Q Pelargoniums have such colourful, bright flowers, so I assume they are good for bees and butterflies? Unfortunately, Pelargoniums are generally unattractive to pollinators, so they are not so good for a wildlife garden. A study into the attractiveness of common garden plants to pollinators by researchers at the University of Sussex found that the popular zonal Pelargoniums were significantly less attractive to pollinators than many other garden flowers such as lavender and oregano. Q The Pelargoniums seem a rather complicated group of plants, and there are lots of them - but I do find them very interesting. Can you recommend where I should go to find out more about them, and to get some advice on sourcing and growing some of the less common cultivars? Try contacting the Pelargonium and Geranium Society (or PAGS). It was formed in 2009 from the British Pelargonium and Geranium Society and the British and European Geranium Society. It holds an annual show and produces a quarterly magazine, the ‘Pelargonium and Geranium News’, which includes articles from expert growers, information about future events, and an opportunity to join discussions in on-line advice forums. The website is http://thepags.org.uk. Q Is it worth growing scented Pelargoniums for use in the home? As well as being very attractive pot plants, some species are grown commercially and the distillate produced from their leaves is used in the perfume industry. The varieties with rose fragrances, such as Pelargonium graveolens, are the most important commercially, as their oils are cheaper to produce than true rose flower oils, and they can be used as a supplement or to dilute the rose oil without impacting the overall quality of the scent. At home, the plants can be grown indoors in pots to provide a natural fragrance, and the leaves can be used to prepare home-made bath fragrances and dried as a component of pot pourri. Many of the scented leaves and flowers of Pelargoniums are edible, and can be used to flavour cakes, jelly, ice-cream, sweet sauces and sponge puddings, or to make refreshing herbal infusions and iced teas. The varieties with rose, apple, orange, lemon or peppermint scents are most commonly used in the kitchen in this way. Suitable lemon-scented species include Pelargonium citronellum and P. crispum. Other types with good culinary qualities include the strawberry-scented variety Pelargonium ‘Lady Scarborough’, the lime-fragranced Pelargonium ‘Lime’, and the peppermint-perfumed species Pelargonium tomentosum. Pelargonium is also widely used in herbal medicine and is an ingredient of a variety of home-made remedies. Many people believe it is useful for digestive problems, fevers, kidney complaints and respiratory ailments, and as a natural antiseptic for cuts and abrasions. Pelargonium oil is used by aromatherapists as a relaxant (though they often call it Geranium oil). Proprietary cold and bronchitis remedies that include oils extracted from Pelargonium sidoides and Pelargonium reniforme have been sold in Europe and the United States. Q Are Pelargoniums suitable for window boxes and patio containers? Zonal and ivy-leaved Pelargoniums are perfect for containers as they are tolerant of under-watering, thrive in sunny conditions, and with some TLC, routine dead-heading and a regular feed of potassium-based fertiliser, they will produce masses of flowers that will brighten up the patio and garden throughout the summer. You can use zonal Pelargoniums to provide the bulk of the planting in window boxes and containers, and by using the same varieties, you can introduce a repeating theme that harmonises the design around the patio and house. Trailing ivy-leaved Pelargoniums provide a perfect complement to them, and these should be planted along the edges of the window boxes, wall-beds and containers so that they trail over the edges.